Angshul Majumdar is an Associate Professor at Indraprastha Institute of Information Technology, Delhi. He completed his PhD from the University of British Columbia in 2012; he finished his thesis in a record time of less than two years. His research interests are in algorithms and applications of sparse signal recovery and low rank matrix recovery. Specifically, Angshul is interested in problems in biomedical signal processing and imaging. 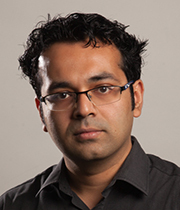 Angshul has written over 70 journal and conference papers since the inception of his research career in 2007. He has recently written a book on Compressed Sensing based MRI Reconstruction which is in print at Cambridge University Press. Sparse Recovery, Low-rank matrix completion, Medical Imaging, Biomedical Signal Processing, Hyper-spectral Imaging, Collaborative Filtering.